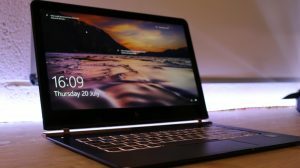 The HP Spectre is sleek, is stylish and is downright gorgeous. It’s matte black and shiny copper finish is makes this a design to rival any ‘pretty’ laptop. Aimed at business men and women, it’s definitely the kind of device you want to be able to flash in the office. So, it looks good, but what can it do? Weighing a minute 1.1kg and barely pushing over 10mm in thickness (32.5 x 22.94 x 1.04 cm) The spectre notebook more than earns its label as HP’s ‘thinnest laptop ever’. The model we’re looking at has a 13-inch HD 1920 x 1080 resolution screen. This spectre also houses a 6th gen i7-6500U processor, an Intel HD graphics 520 chip, 512GB internal storage, 8GB RAM and off the bat the Windows 10 Pro 64 operating system. The HP Spectre Notebook for all intents and purposes, a business laptop, aimed towards the travelling and slightly flashy business person. And the snazzy notebook delivers. I took it on as my desk laptop and was not disappointed. I was able to use my regular office programs, access my online drives and run more taxing programs, such as adobe, with ease. I’ve noticed the odd review claiming the fans were noisy and I must say I disagree, they were near silent if they turned on at all and the 38 Wh Li-ion polymer battery remained mostly cool throughout. The battery life was also fairly, under heavy usage, including downloading, adobe design programs and streaming the battery lasted my working day. As a fan of games and all things film, I had to test out the Spectre’s capability in this field. For a light gaming session with an online or windows store game, the HP Spectre runs smoothly and displays a crisp and clear picture on its HD screen. Any larger game would struggle to load, as seen with the 360 model of the Spectre and is near unplayable – even downloading a larger game took FOREVER… and ever… and ever. That being said, this isn’t a gaming laptop and so light gaming to pass the time on any train journey should more than suffice. Perhaps my biggest issue was the lack of ports. 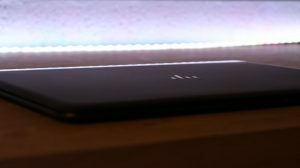 The downside to how thin the Spectre is, is that there’s physically no space for your regular USB, HDMI and Display ports. The only ports we’re given are two USB type C ports, a headphone jack and the power port. There is of course the option to purchase a separate adapter in both ‘travel’ and ‘elite’ forms (dependent upon how many ports you’d require) should it be necessary to your day to day use. The HP Spectre Pro 13 G1 Notebook is without a doubt a gorgeous machine. Any business woman or man would be lucky to hold this sleek device as their own (for the small price of £1,558.80!!!). Though it’s safe to say it’s suited more towards those on an online, cloud storage basis. Alone, the laptop is tricky to use, but in a modern world that learnt to adapt to life without the floppy disk, and even now without the CD-ROM, perhaps HP are merely a step ahead of the game with this one.